Perhaps no stretch of Tacoma better shows off the city’s revitalization than Ruston Way, the city’s beloved walkway along Commencement Bay. Its two miles of smooth pavement are terrific for kids on wheels, while a series of small parks invite walkers to stop and enjoy the view or explore the beach. The north end of the path, formerly the site of the Asarco Smelter, has undergone a remarkable clean-up and transformation. It is now home to the Point Ruston complex of luxury apartments and condominiums, as well as a public sprayground and playground, restaurants and a swanky movie theater. You can easily spend an afternoon exploring from one end to the other. The itinerary described below starts at Point Ruston at the north end of Ruston Way. You’ll find ample parking at Point Ruston in the structure you see as you enter from the roundabout. 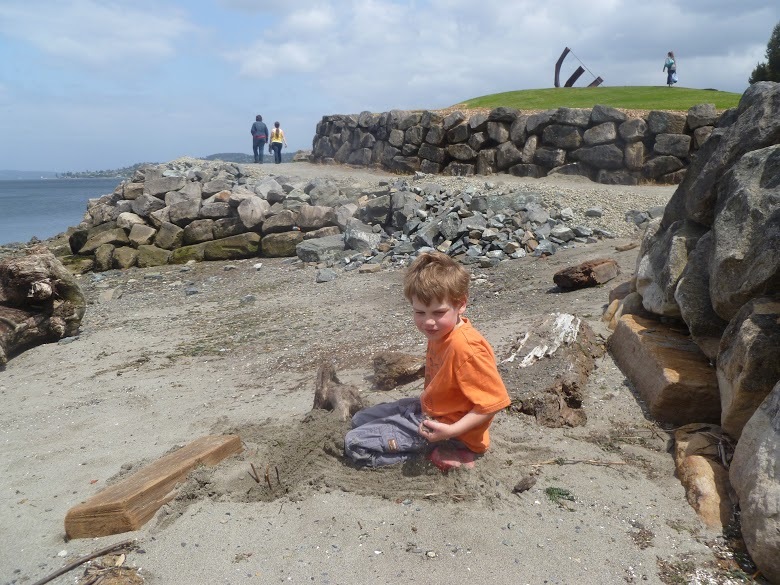 You may want to explore as much as your younger walkers and riders can handle on Ruston Way and then send a grown-up with more endurance back to fetch the car. 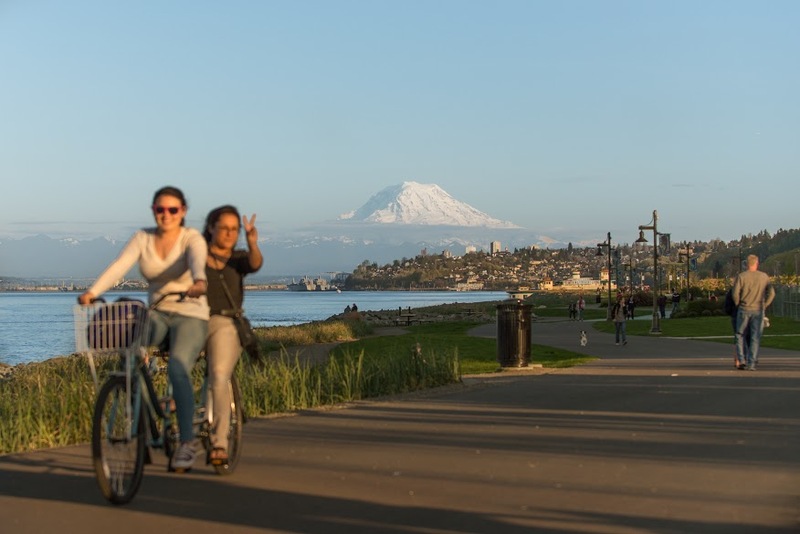 Here are our favorite ways to explore Ruston Way! 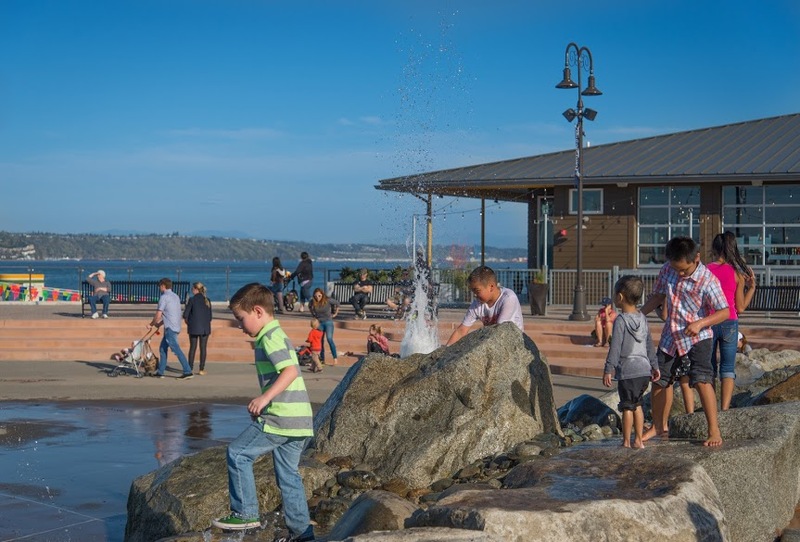 On the promenade in front of Point Ruston (5005 Ruston Way) you’ll find a ferry-boat themed playground and a newer sprayground that opened last year. The playground is small but offers plenty of fun for imaginative kids, and it’s hard to think of a play structure around with a better view. The sprayground, designed to blend into the natural elements, features decorative rocks and water that squirts up in a pattern to mimic fish jumping and swimming. It is currently operating from noon–10 p.m. and is already a huge hit with local kids needing to cool off. The sprayground is free and open to the public. Find public restrooms between the new fish-and-chips window and the main entrance to the WildFin restaurant (also a good option for lunch). You can read more about the playground and sprayground on Point Ruston's blog. More detailed driving directions are here. If you’d like to explore more of Ruston Way, rent a bike from Wheel Fun, also in the Point Ruston complex. It offers hourly rentals of everything from traditional children’s bikes to surreys. Whether you’re biking or hoofing it, you’ll want to fuel up with a coffee and pastry from Italian bakery Dolce Si. You need your energy, right? You can also pick up traditional treats like gelato and cannoli. There are seven Metro Parks Tacoma parks along Ruston Way, each just a short stroll (or pedal) from the other. 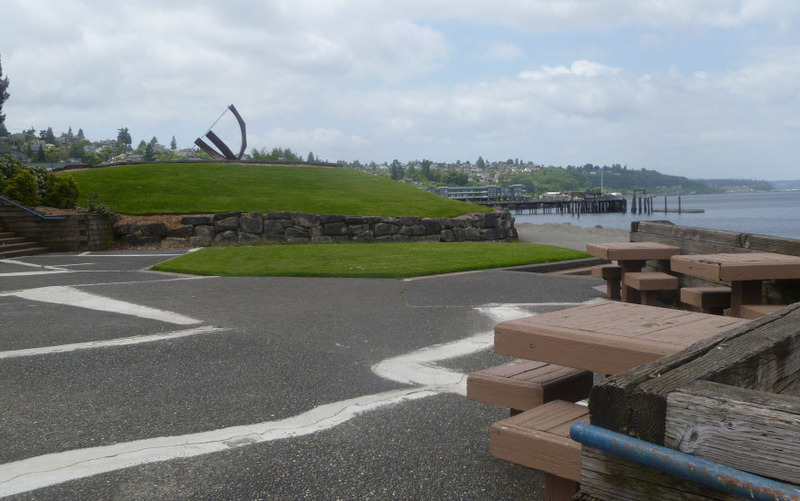 The closest to Point Ruston is little Cummings Park, which has picnic-friendly grassy areas. Since you’ve just started, continue on to Marine Park and the Les Davis Pier (both at 3427 Ruston Way), a spot which is the hub much action. Go out on the pier and see what’s biting, or take the small stairway to the left for beach access (be sure to look at the photos of the sea creatures on the wall). Children will enjoy watching scuba divers going in and out of the water at this popular dive spot. There is also a small snack stand that sells scoops and a historic fire boat that is fun to look at. You can also fuel up at the mini restaurant row here. The Ram (3001 Ruston Way) offers quick service and kid-friendly eats. Get a burger and try to score a seat on the deck over the water. 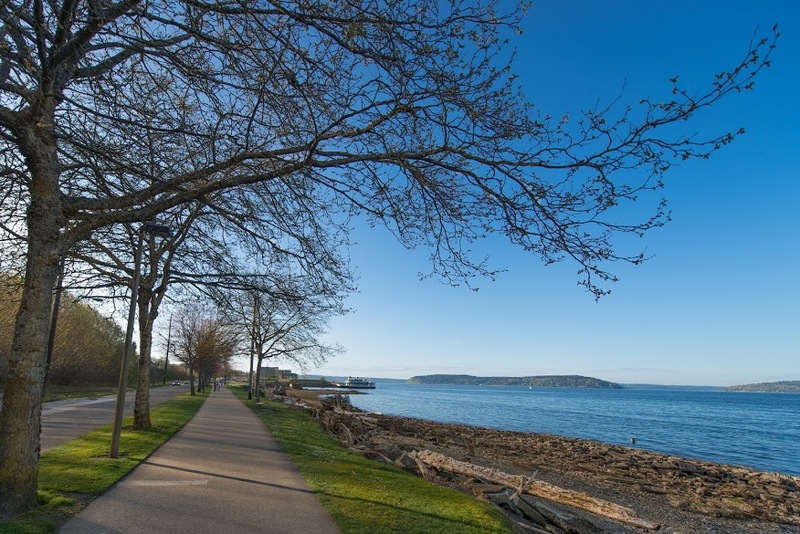 You’ll find gorgeous, panoramic views of Mount Rainier all along Ruston Way. If you’re feeling brave, you can get a bird’s-eye view via a parasail, with the help of Pacific Parasail, next to The Ram restaurant. Kids as young as age 5 can parasail (kids ages 5–10 fly free with an adult). Those who prefer to keep their feet planted on the ground will enjoy walking out on the bridged walkway at Dickman Mill Park, the site of one of the area’s last lumber mills, and the next park along your walk (2423 Ruston Way). Beach access is available at several points along Ruston Way. Unless the tide is low, there won’t be tons of sand, but most children only need a little bit to be happy. Little Hamilton Park by the Silver Cloud Inn is a likely spot (2321 Ruston Way). At the southern end of Ruston Way, Jack Hyde Park marks your last chance for public beach access along your walk. It’s also a good place to see container ships; and paddle boards are rented here in the summer months from Dolan’s Board Sports. (This is a seasonal operation, so do check before you go.) Children will be interested in the sun dial at the small park. You'll also find picnic tables and a small, grassy hill that's perfect for lounging. For some local history, make a final stop at Chinese Reconciliation Park, just south of Jack Hyde at the southern end of Ruston Way (1741 N. Schuster Parkway). The park commemorates a dark chapter in Tacoma's history, when Chinese residents were expelled. The small park includes lovely gardens, a pavilion and stone lions. Kid-friendly dining options have expanded around Ruston Way. If you can wait until you make it back to your starting point, Point Ruston Complex offers several solid dining choices, including the new walk-up fish-and-chips window, The Daily Catch, at WildFin American Grill. The menu includes fish and chips and fish tacos. The kid’s meal comes with a piece of fish, a drink and a cookie. Or, from the south end, go just up the hill into Old Town and grab a bite at The Spar, which has typical pub grub and a small section of toys and games for the kids (2121 N. 30th St.). From Ruston Way, cross the train tracks (carefully) across from The Old Town Dock and find it at the top of the hill. Still have time on your hands, or perhaps an extra day? The north end of Ruston Way is close to Point Defiance Zoo and Aquarium. 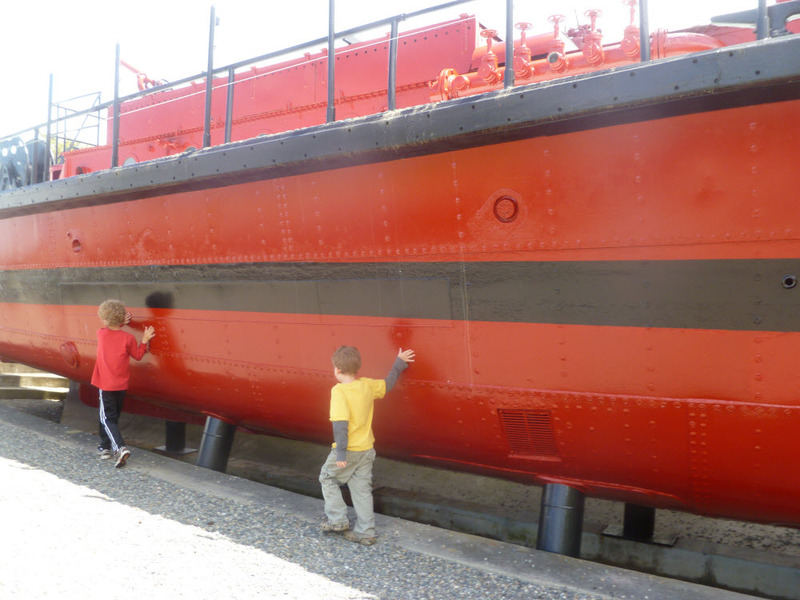 Or, from the southern end, continue your exploration of Tacoma’s historic waterfront at the Foss Waterway Seaport Museum. North-to-south route: We described a north-to-south walk along Ruston Way, but you can start at any point you wish. We chose to begin at the north end because kids are likely to be most interested in the playground and sprayground by the Point Ruston complex, and there is plentiful public parking there. South-to-north route: If you’d prefer to start at the south end, there is some parking across from Jack Hyde park, and there is also parking in the middle of the walk near Marine Park and the Les Davis Pier. Note: On sunny weekends, Ruston Way is hopping with people and parking can be tight. When to come: If you want to have a less crowded pathway, come during the week or as early in the day as you can. No matter when you come, you will have company, and people-watching is part of the fun! Editor's note: This article was originally published in June 2016 and updated in July 2017.